Butter Cookies (Banh Bo) are simply irresistible and this 6-ingredient recipe is fail-proof. 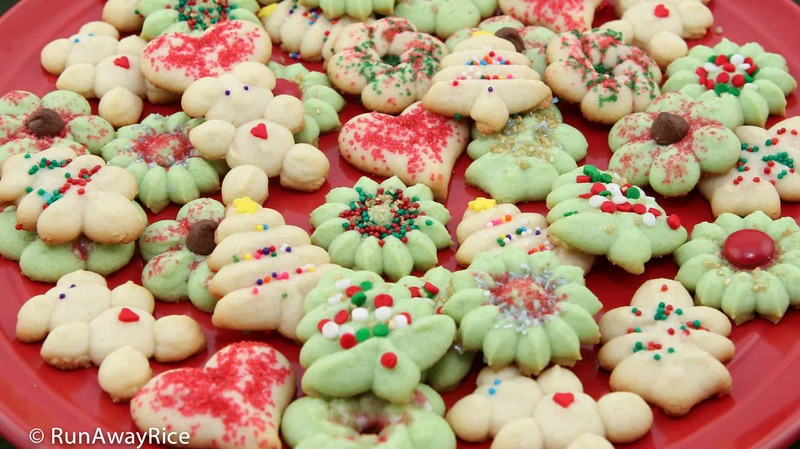 These buttery and crispy cookies make awesome holiday sweets or delicious everyday treats. The Butter Cookies are baked to golden perfection, light and crispy with just the right amount of sweetness. 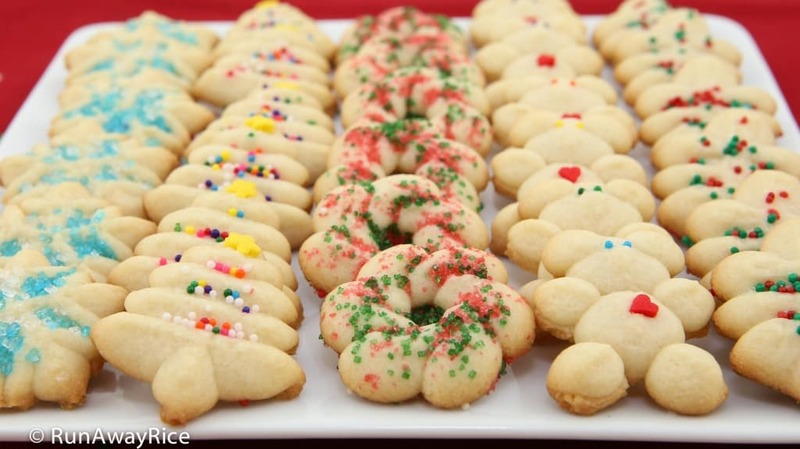 One of my favorite things about this cookie recipe is there’s no rolling and cutting dough. This Butter Cookie recipe uses a cookie press so cookies are super easy and fast to make and perfectly uniform. Love it! Once you make cookies with a good cookie press, you won’t go back to the roll-and-cut method ever again. Turn these Butter Cookies into festive holiday treats by decorating them with colored sugar, sprinkles and assorted candies. There are no hard and fast rules when it comes to decorating cookies. It’s a wonderfully fun activity for the whole family and even the little kiddies can join in too. Happy Holidays! The butter and egg should be at room temperature. About an hour before starting this recipe, remove from the fridge and set on the counter. This recipe makes cookie dough for using with a cookie press. 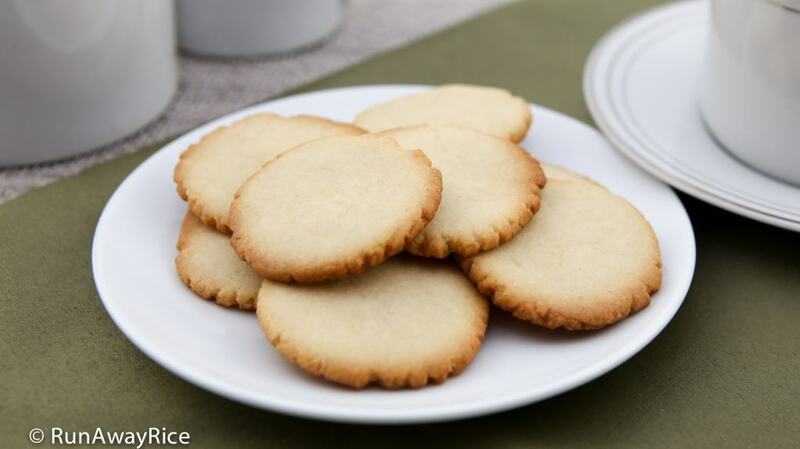 You can still enjoy this wonderful recipe even if you don’t have a cookie press. Simply roll the cookie dough into small balls and then flatten with a spatula or spoon. Alternatively, use a small cookie scoop to transfer the dough to a baking sheet and then flatten the mounds. Adjust the baking time accordingly for larger-sized cookies. The cookie dough can be made ahead and refrigerated for up to 1 week. The dough can also be frozen for up to 3 months. Let the cookie dough come to room temperature before pressing into cookies and then baking. 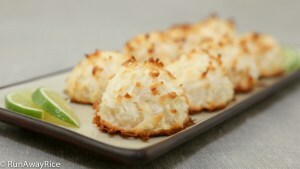 To make Pandan Butter cookies, substitute the vanilla extract with 1/4 tsp Pandan paste. Bake at 375 F (190 C) for 8-10 minutes or until the edges are brown. Store the Butter Cookies in an air-tight container and enjoy within the week. Butter Cookies can be refrigerated for up to 3 weeks. This recipe can be easily double, tripled, etc. to make more cookies. The recipe yields approximately 6 dozen (72) cookies. This may seem like a lot, but the cookies are bite-sized and so good, they’ll go fast! Preheat the oven to 400 F (204 C). In a mixing bowl, add the sugar, salt and butter. Using a flat beater and on Medium Low speed, cream together the ingredients until light and fluffy, approximately 2 minutes. Add the egg and vanilla extract while continuously beating until incorporated. On Low speed, gradually add the flour. Beat until well incorporated, (dry flour is no longer visible), approximately 2-3 minutes. Scrape the dough off the flat beater and down the sides of the bowl. Mix together for another 30 seconds. 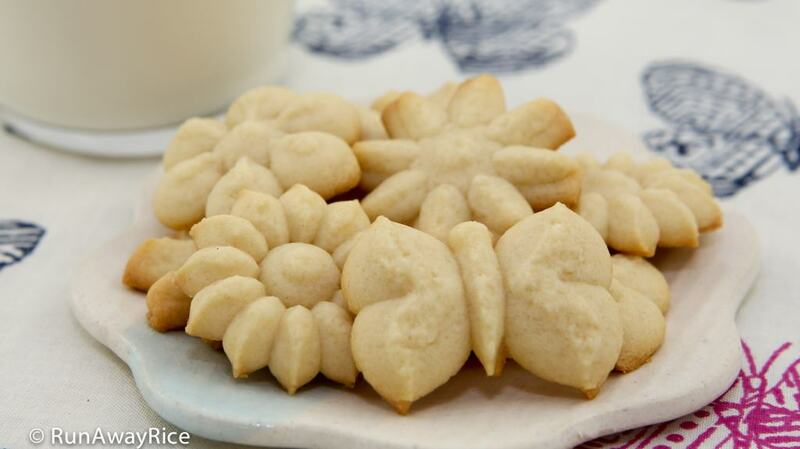 Transfer some dough into a cookie press with the desired decorative disk attached. Pack the dough in the barrel eliminating any large gaps. Press the dough onto an ungreased baking sheet making the desired number of cookies. Swap out the disk and make cookies in other shapes. 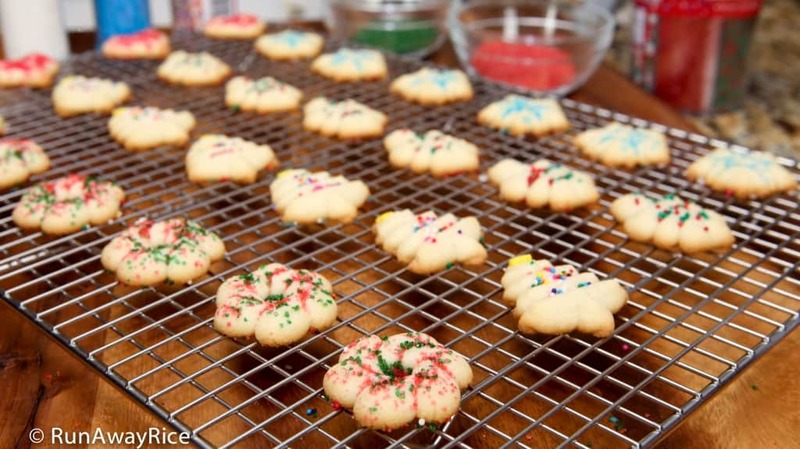 Sprinkle the cookies with assorted colored sugars, sprinkles and candies. Bake for 8-10 minutes or until the edges are brown. Rotate the baking sheet halfway through the baking time so the cookies brown evenly. Use a spatula to transfer the hot cookies to a wire rack. Butter Cookies are simply irresistible and this 6-ingredient recipe is fail-proof. 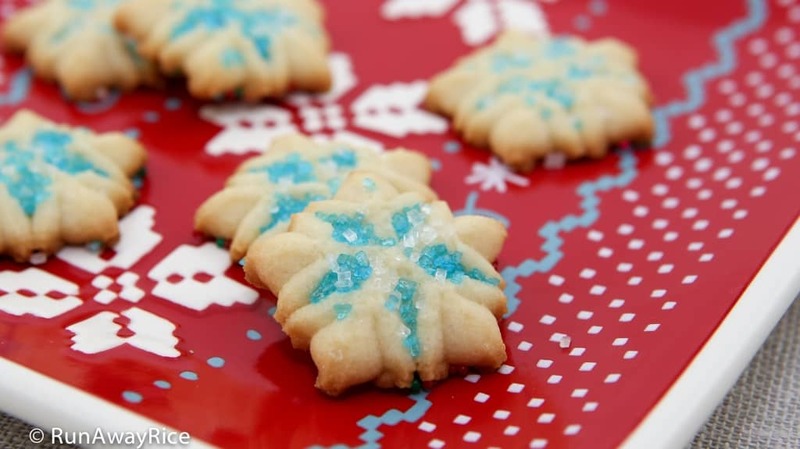 These buttery and crispy cookies make awesome holiday sweets or delicious everyday treats. The Butter Cookies are baked to golden perfection, light and crispy with just the right amount of sweetness. 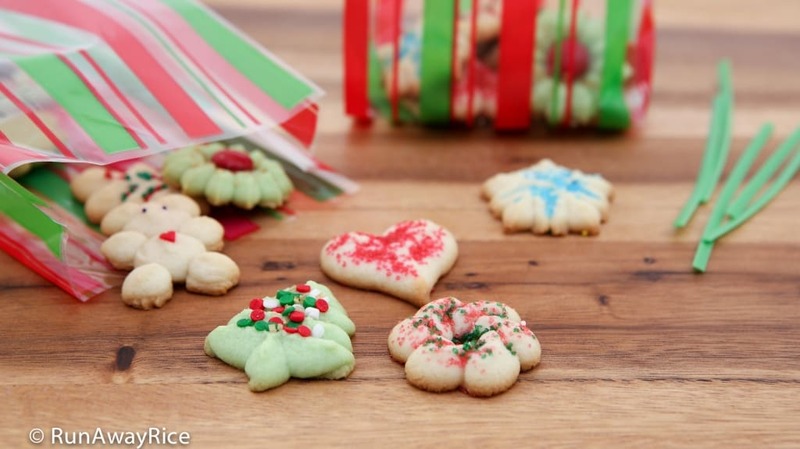 One of my favorite things about this cookie recipe is there's no rolling and cutting dough. This Butter Cookie recipe uses a cookie press so cookies are super easy and fast to make and perfectly uniform. Love it! Once you make cookies with a good cookie press, you won't go back to the roll-and-cut method ever again. Turn these Butter Cookies into festive holiday treats by decorating them with colored sugar, sprinkles and assorted candies. There are no hard and fast rules when it comes to decorating cookies. It's a wonderfully fun activity for the whole family and even the little kiddies can join in too. Happy Holidays! This recipe makes cookie dough for using with a cookie press. 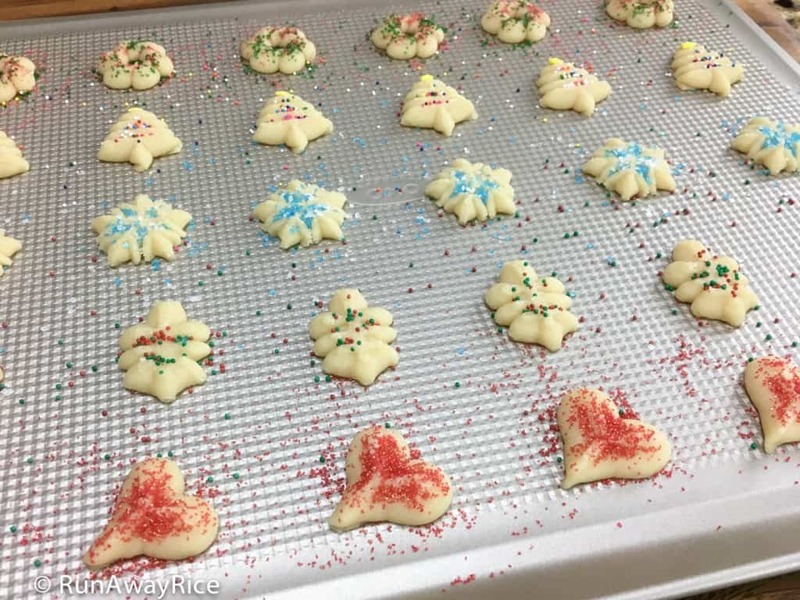 You can still enjoy this wonderful recipe even if you don't have a cookie press. Simply roll the cookie dough into small balls and then flatten with a spatula or spoon. 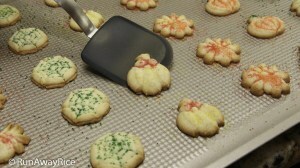 Alternatively, use a small cookie scoop to transfer the dough to a baking sheet and then flatten the mounds. Adjust the baking time accordingly for larger-sized cookies. The dough can be made ahead and refrigerated for up to 1 week. The dough can also be frozen for up to 3 months. Let the cookie dough come to room temperature before pressing into cookies and then baking. To make Pandan Butter cookies, substitute the vanilla extract with 1/4 tsp Pandan paste. Bake at 375 F (190 C). I have not tried this recipe with rice flour. 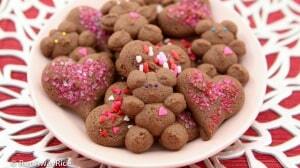 In the past, cookies made with all rice flour didn’t taste very good and had a strong raw flour taste. If you’re trying to make the cookies gluten-free, I would recommend using sorghum flour, almond flour or a combination of flours. Good Luck! What exactly was the issue when using your cookie press? Did the dough not drop from your cookie press? Thanks for your reply. Yes, dough didn’t drop from the cooke press. It was very sticky. Please add more flour to make the dough less sticky. This should help it to drop from the cookie press. Optionally, you can roll the dough into a log, refrigerate for 1 hour and then cut into thin slices and bake if the cookie press isn’t working. Good Luck! I received an Oxo cookie press as a present earlier this year but never took it out of the box thinking it wasn’t going to work. Your post inspired me to give it a try. My kids and I had a blast and made so many cute Christmas cookies. Thanks for sharing your recipe and inspiring creativity!